A conventional lamp is still often used for outdoor trading activities at night in Jakarta and surrounding areas, therefore friendly environment portable lamp with good overall system is needed as the product of choice in the trade activity to move towards the future. The purpose of this research is to design a portable lamp system that is integrated with the battery charing system. The battery charging system is able to reduced the charging current when the battery is fully charged. Simple battery charger is used on this battery charger system design, while the design of synchronous buck converter will used to control the portable lights system. In the experiment, simple battery charger capable of charging the battery properly. When entering the voltage above 13 volts, the charging process will be slowed down. The result showed that the VRLA battery can be charged by using simple charger with stable temperature, but the power efficiency of charger is very low at 11.9%. The LED light that was designed, has 330 lux of illuminance. LED light controller module has a success rate of 0%. The LED light power efficiency using power source adapter only reached 17.9%.(DMS). 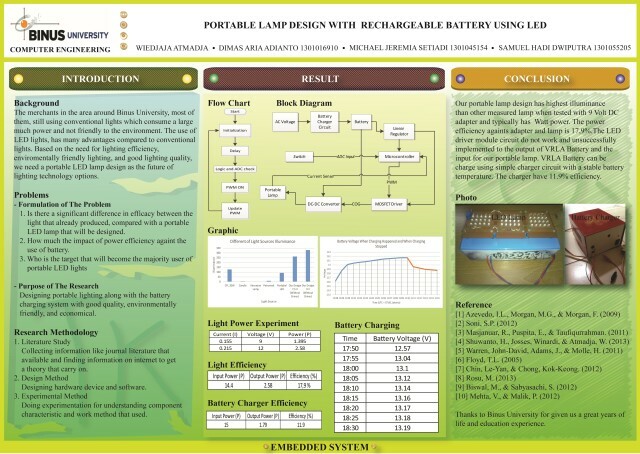 Keywords : portable lamp, battery charger, LED driver, power efficiency.